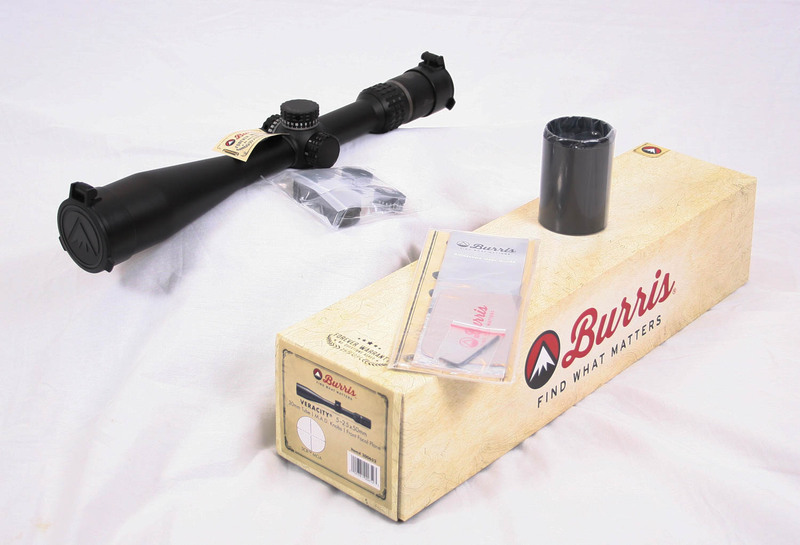 Burris is an interesting scope manufacturer that has baffled us often and surprised us on occasion. They are a USA based company, but like most scope makers they do not manufacturer their scopes here, but even that is not completely true with their upcoming XTR III. A few decades back they used to make their optics here and as the industry changed they had to as well, but that appears about to change later this year with that new model. They also have an odd mix of scope lines and models that keep us guessing and often times frustrated due to their feature availability on certain models. Then, they drop a gem like the XTR II that is actually a really nice scope for the money. They have many scopes that would actually make very good tactical scopes for a moderate cost, but then they don’t put any sort of a tactical reticle with them which hampers their usefulness for snipers. Which is actually what they did with the Veracity scope as well…except, for one version of it, the 5-25x50mm. 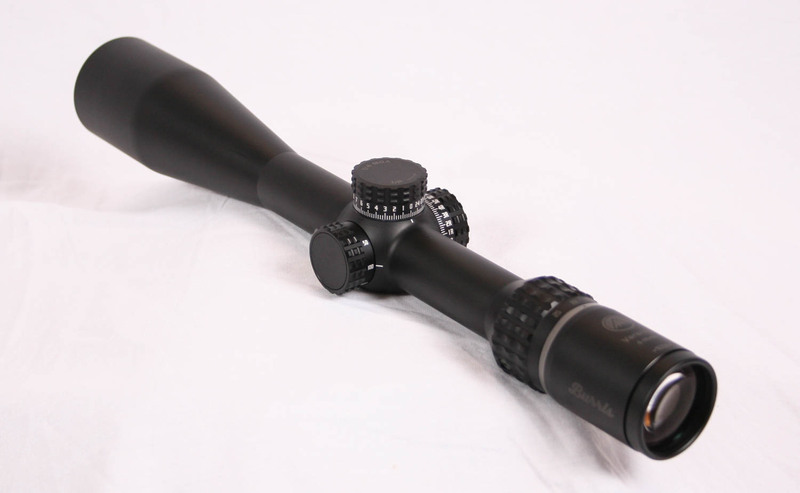 This scope they offer with the SCR MOA reticle, which can work well for sniping and long range shooting. The scope seems to offer all the other features we like, so we thought we should see how it does in a test. The Veracity arrives nicely packaged in a normal large Burris box with high density foam surrounding the scope. Included in the box is a sunshade, flip up scope caps, an Allen wrench for slipping the knobs, instruction manual, and a set of smaller adjustment dials and dust cover caps that are a part of their MAD dial system which we will talk about in a bit. The overall impressions of the scope when opening it up are positive. The scope is packaged nicely and looks good and the sunshade and additional knobs are both bonus features that are usable and even the flip up caps are okay quality and usable. Flipping the scope over and looking at the bottom reveals that it is made in the Philippines which is where a majority of the higher quality Burris scopes are made. 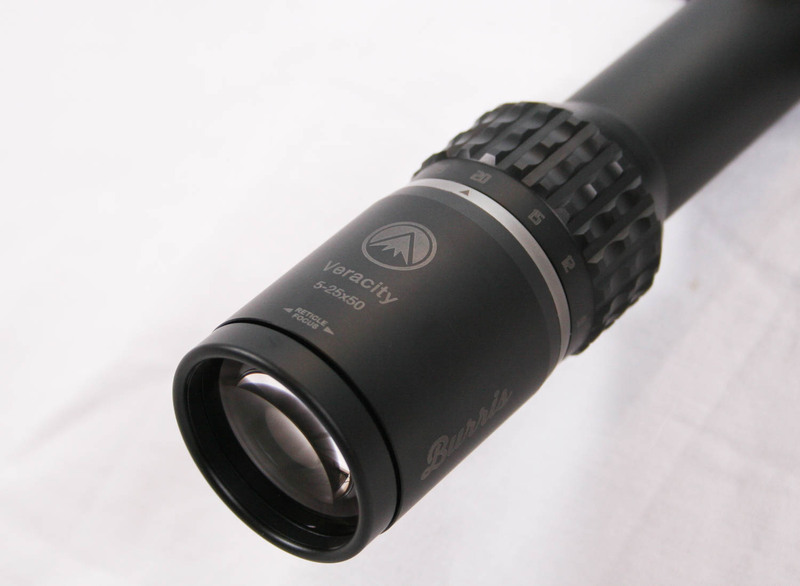 The Veracity is categorized by Burris as a part of their hunting scope lineup, but it does seem to have many tactical features and looks tactical. The eyepiece housing is the same Burris shaped housing that is found on the XTR II. 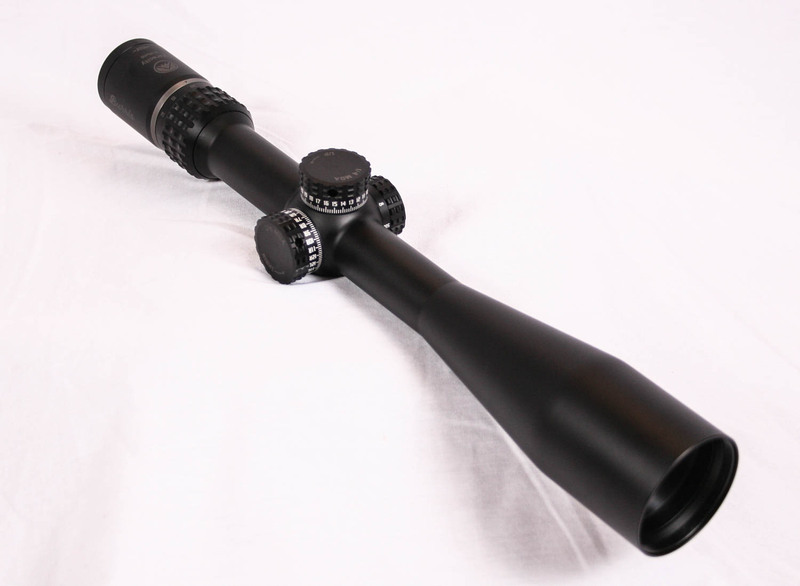 It is moderately large and has a fast focus eyepiece without any rubber ring on the end that is common on many scopes. The eyepiece adjusts through its entire diopter range in only a single revolution, which is very fast. Unfortunately there is no indicator mark to tell you where the diopter focus is set to in order to come back to it for different shooters. It is a matter of focusing the reticle each time a different shooter uses it. The shape of the ring itself is very smooth and can be difficult to grab and rotate due to the moderately high level of resistance, which does work to keep it set in place once adjusted. At the front of the eyepiece housing is the zoom power control ring which does have aggressive knurling, the same of which is found on the XTR scopes and it provides a good gripping surface, even to the point where it can be slightly painful in cold weather without gloves. There are subdued colored markings on the power ring from 5x to 25x which are a bit small and can be hard to read, especially if a low light scenario. The indicator arrow is marked on a brushed aluminum ring that offers a nice aesthetic look that is not bright and still tactical in nature. The rest of the markings on the eyepiece are all the same subdued grayish, greenish color as the power numbers. The 30mm diameter scope tube is smaller than the XTR II 34mm tube and is one of the areas that is different between the two scope lines. In front of the zoom power ring there is 2.50″ of length for which to mount the rear scope mounting ring and then the tube transitions into a large rounded shoulder where the elevation, windage and focus knobs are set. We ordered this particular model of Veracity because it came with the Burris M.A.D. knob system which standards for Modular Adjustment Dial. In essence, it gives you some options for what you would like the knobs to do. There are three different types of knobs available with the MAD system, a tall exposed turret, a low exposed turret and a knob with dust covers. This particular scope came with the low exposed knobs and the dust covered knobs. The low and wide knobs tend to work well giving a lot of adjustments per revolution, 25 MOA in this case, and the larger diameter provides a bit more purchase area to grab and extra leverage to ease adjusting it, this held true during our testing. Burris indicates that the Veracity 5-25x50mm scope has 64 MOA of adjustment, which for a 30mm tube is actually pretty low. When we tested this scope it had a total of 72 MOA of elevation, eight more than the factory specs. 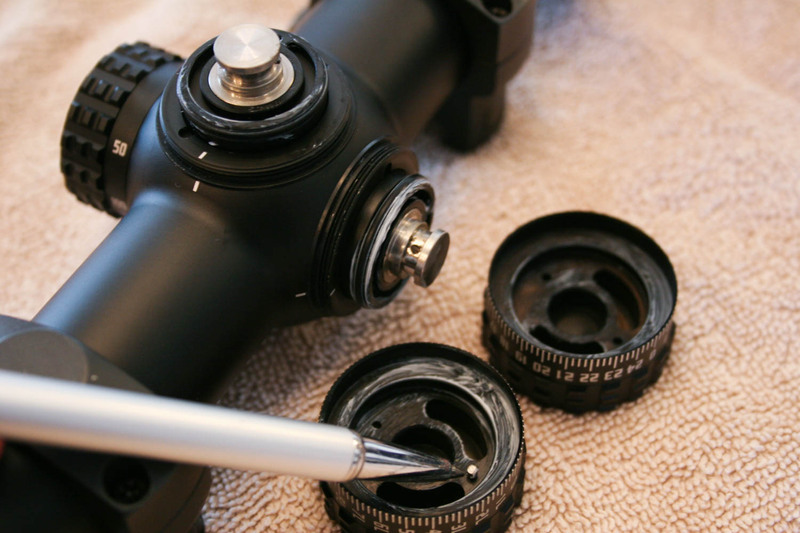 Burris has always had a lower than average amount of adjustments in their scopes and we are not sure why, perhaps they do this to refrain from putting extra stress on the internal springs when you adjust the scope to the extreme. 64 MOA of adjustment combined with a 20 MOA canted base, in theory gives you over 50 MOA to play with. This is enough to get some long, but not extreme, range shooting done, obviously depending on your caliber and rifle. The extra eight our scope has will be gladly welcomed. But there is a catch with the Veracity. They advertise the scope as having a zero stop feature…unfortunately with this knob, that zero stop ALSO keeps the knob from rotating past a single rotation and stops at 24 MOA! This completely blew us away and frankly, it is not a good engineering decision on this particular scope. It has the magnification, the features, and is even advertised as being a long range scope, but then you limit the knobs to a single rotation? This is one of those things about Burris that baffles us and completely frustrates us. With only 24 MOA of adjustment, you are only able to take a 308 shooting 175gr ammo from 100 to maybe 800 yards, which is great for only one rotation, but then that is it. You could hold with the nice MOA reticle, but you still have over half of your elevation adjustment that is not being used. The other provided MAD knob, the smaller ones with the dust caps, has this problem as well and it was something we were not happy with. 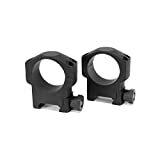 We are familiar with how Leupold does this same thing on their BDC knobs that they provide for the Mark AR scopes with the P5 dials and so we looked to see if Burris used the same method of limiting the rotation. Sure enough, if you remove the knob and flip it over you will see a small silver protrusion that rides in a machined grove on the shoulder itself. When that protrusion hits the end of the grove, it stops and cannot proceed. So, with the help of a pair of needle nosed pliers, we grabbed the little protrusion and while spinning and pulling on it, we were able to remove it from the knob with a little bit of effort. Guess what, no more dial stop and we can adjust it beyond a single rotation! Of course, this also means there is no zero stop either. Additionally, there is no way to know if you are on the second rotation as the knob does not raise in elevation and there are no horizontal hash marks to provide a reference. This means prudent tracking of what adjustments you have dialed in will be required, though with 25 MOA per revolution, it helps minimize how often you will go past a single revolution. In the picture above, we are pointing at the little protrusion that we left in place on the windage knob. If you look at the elevation knob sitting next to it, you can see what it looks like after we removed it with our pliers. We included the scope in the picture as well so you can see the track that that protrusion rides in on both the windage and elevation knobs. The clicks themselves are very good, if not excellent. The large diameter knob combined with the nice clicks makes for a very pleasant elevation control. The markings are clear with a small hash for each .25 MOA click. On the right hand side of the scope is the windage knob which counts up in both directions and has a small L and R to indicate which way the wind has been dialed in, which we prefer. As mentioned, the wind knob also has a stop on it which does not allow you to go beyond 12 MOA of adjustment left or right. For the wind, that is not as critical and it allows for a .308 rifle shooting 175gr ammo to shoot out past 1100 yards in a direct 10 MPH crosswind. There is only a total of 30 MOA of adjustment range on the windage, though this should be enough to allow for the hard stop at 12 in each direction with some buffer for zeroing. If you need or want all of that windage for use, then you would need to remove the protrusion on the windage knob as well. We left it in on our test scope. On the opposite side of the windage knob is the adjustable parrallax, or side focus. It is marked from 50 yards to infinity and takes up about 3/4 of the circumference of the knob. The knob is smaller and a bit stiff and is perhaps not as smooth as we might prefer, but it does seem to work fine and is easy to grab. All three of the control knobs have the same pattern knurling around the top of the knobs as is found on the zoom power ring which helps with grip. 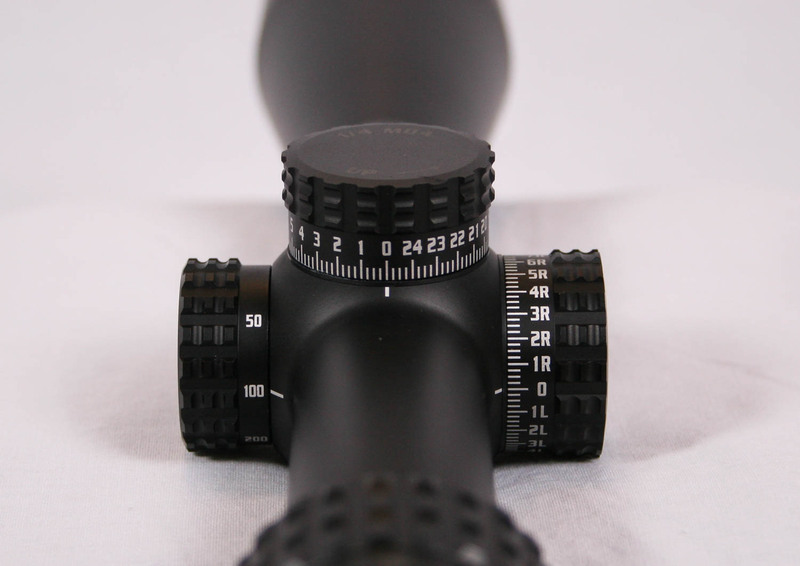 In front of the shoulder there is an additional 2.40″ of tube length to mount the forward scope mounting ring and then the one piece aluminum tube tapers up into the bell where it houses the 50mm objective lens. 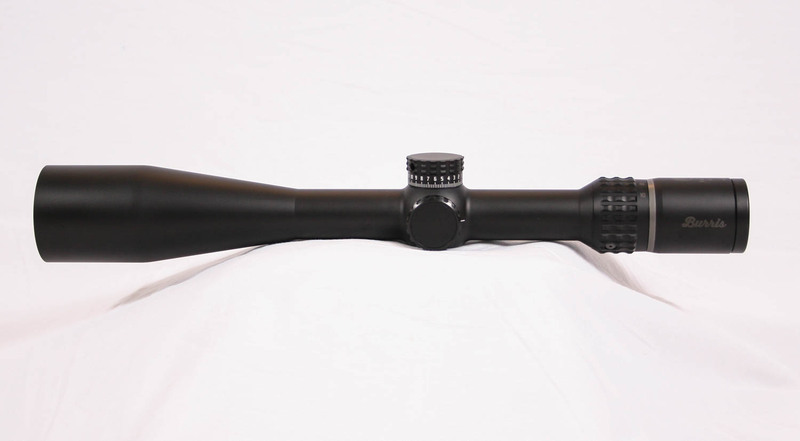 The entire scope has a nice high quality matte black anodized finish with very few markings on it. The markings on the control knobs are a brighter white than those that are on the eyepiece which gives it a mismatched appearance, but it all functions well and while the scope may be targeted toward hunters, it certainly appears tactical. 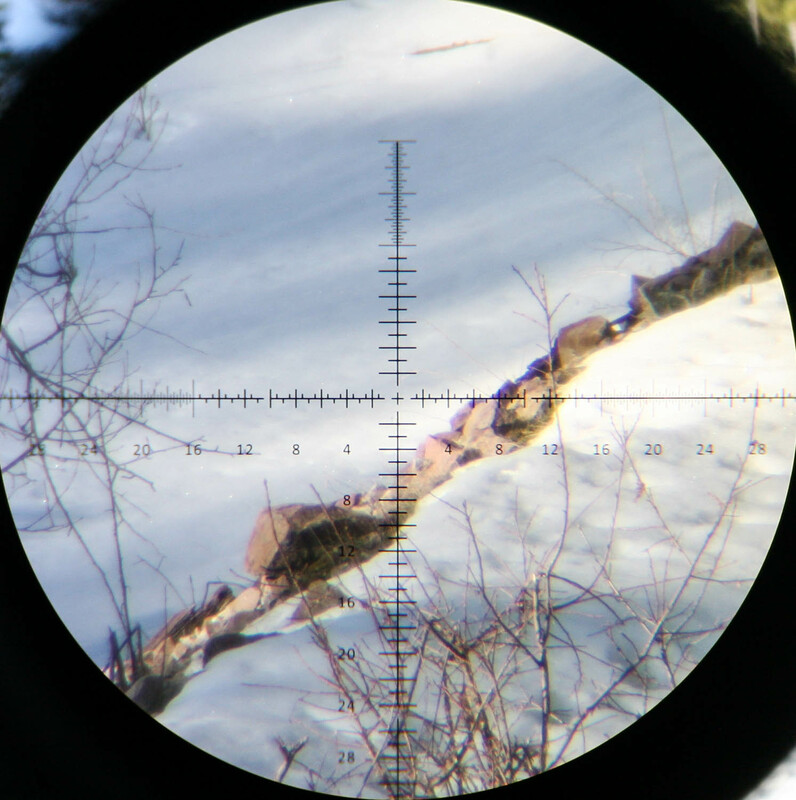 Burris calls this reticle their SCR-MOA, which stands for Special Competition Reticle. It is a hash reticle design calibrated in MOA. Each hash mark is separated by 1 MOA with larger hashes every 4 MOA. The MOA marks obviously can be used for hold offs for both wind and elevation and just as important for snipers, they can be used for accurate range estimation. There are numbers along the horizontal and vertical stadia which does clutter up the view as there are a lot of numbers at each 4 MOA hash. Beyond perhaps the over abundance of numbers, the reticle is pretty good with even finer graduations at .5 MOA marks at the ends of the upper vertical and left and right stadia lines. This particular scope has a non-illuminated reticle but some of the Veracity scopes do come with an illuminated reticle. The reticle is located on the first focal plane, so it does grow and shrink with the zoom power and makes it so the magnification setting is not important for using the reticle for measuring or holding off. When set to lower magnifications, the numbers, and the hash marks, do disappear and are not usable. The scope needs to be on about 9x or higher in order for all those markings to be seen with enough detail to be usable. The other reticle options on the Veracity scopes are geared more toward hunting without range estimation ability, except for maybe the Ballistic Plex E1 Varmint which may have some tactical potential. For our shooting tests we mounted the scope to our Remington 700 .308 test rifle, with its Warne 20 MOA canted base. We used a set of high quality steel Leupold Mark 4 30mm rings. The mounting process did not take long and was straight forward and with the scope mounted we headed out to the range on a sunny 28 degree day in Montana. There was still plenty of snow on the ground but the wind was a mild 1-3 MPH and the weather provided good shooting conditions to test the scope. 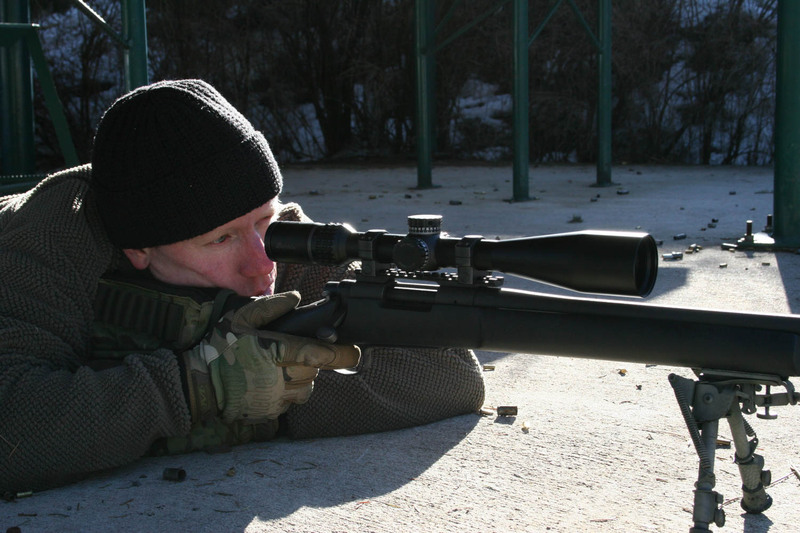 If you are not familiar with how we test scopes, please read the article how we test rifles and scopes. We quickly boresighted the rifle and got the scope zeroed at 100 yards and began our tests using Federal Gold Medal Match 168gr ammo which shoots very well through this rifle. The box test shot very well with the bullet impacts at the corners matching the measurements of the reticle, which both matched the actual size dialed into the scope. The final impacts came back to the initial zero giving good indications that the tracking is solid on the scope. We then fired out reference group for the click size test, measuring about .7 MOA and then dialed in 20 MOA of left, fired our second group and then dialed back in the 20 MOA of right and fired one more round to insure it was back on the original group, which it was. The distance between the two groups measured 21.1″, compared to the theoretical 20.94″ that should measure. This is only 0.7% error. Because of the error that is introduced to the test with group sizes, we consider anything under 5% passing and under 3% error to be excellent. Obviously, this is an excellent result. While shooting, we continued to like the clicks and knobs, they are a bright spot on the scope, though we found the side focus to be a bit too touchy at the 100 yard range and sometimes chased getting a perfectly sharp picture. At longer ranges it worked better for finding a sharp picture. Not being able to track what rotation the elevation knob is on will be a nuisance for some, though if the rifle is a mid range rifle, it should not be a problem. The optics are very bright, which can be a strain on your eyes in a bright snow environment like we were in while testing. To wrap up our operational testing we needed to check for reticle drift with both the zoom power and the side focus to insure that the internal mechanisms were true and precise. So with our bore-sighting grid mounted to the rifle we tested the zoom power first going from the bottom 5x up to 25x and back several times, watching to see if the reticle moved at all, which we are happy to report that it did not. It remained rock solid. When we tested the same for the parrallax adjustment, meaning the side focus knob, we did detected some movement. Going from the lowest 50 yard setting up to about the 200 yard marking, there was about .5 MOA of movement, and then it is solid until the 500 yard marking. From the 500 to the top end of the adjustment range at the infinity mark, there is about another .5 MOA of movement. The movement in the lower range is small and likely would not be noticed at ranges that close, but the half MOA of movement at the upper end may be noticeable at ranges over six or seven hundred yards. A half MOA movement at 1000 yards is moving the bullet strike five inches. The movement isn’t horrible, but we didn’t like it either. We also have added in a new test to our testing regime with the boresight grid attached. We now square up the grid and align the reticle with a grid line and then watch the crosshairs as we dial in elevation, and then windage adjustments over an extend range. This is done as another test of the tracking of the dials. As we dial in elevation, the crosshairs should stay right on the grid line it is aligned with and not wander off that line. Same for the windage. The test on the Veracity performed very well, confirming what we had observed earlier that the adjustments track true. So what is our conclusion on the scope? For a $900 scope, it didn’t do bad, but not great either. The limitation of elevation knob with its rotation stop and no way of tracking multiple rotations is indeed a handicap, but the shape of the dial and its clicks are very good. It tracks true, it is not too large, it has good optics and includes some good features. The movement of the reticle with the parrallax adjustment, especially at the upper end, is another negative mark we had to consider as well. The reticle has a lot of capability as does the magnification range and with the included accessories like the sunshade and MAD knobs it can be a solid long range option. But with the above mentioned deficiencies, we cannot give it the SC Endorsed label and award it 3 stars out of 5. It could have been excellent with just a few tweaks and changes, so once again we find ourselves a little baffled by a Burris scope. Too bad you didn’t get the option without mad Knobs. I have two of the Veracity 5-25 x50’s . One has MAD knobs the other tall knobs. I did very well in your July class (2018) with the Tall Knob version of this scope in the on a 6.5 Creedmoor. I very much dislike the MAD knobs and Burris should eliminate them from their lineup. That said with the tall knobs that I have, you get the tracking your are rightly complaining about. I will have to test the parallax POI shift as my shooting partner with same make model and caliber rifle with the same Veracity Tall Knob scope was consistently not needing to dial in wind where I was always dialing in at least a .5 to 1 moa right shift on my rifle for shots greater than 700. What I would point out in your review, is that you are taking a scope aimed at longer range hunters and looking at it from a tactical sniper set of colored of glasses. (which for your site is appropriate). I would nuance your rating, I agree that the mad knob model which you tested earned its 3 stars, that said for the average longer range hunter and honestly i think the vast majority of those taking your classes. 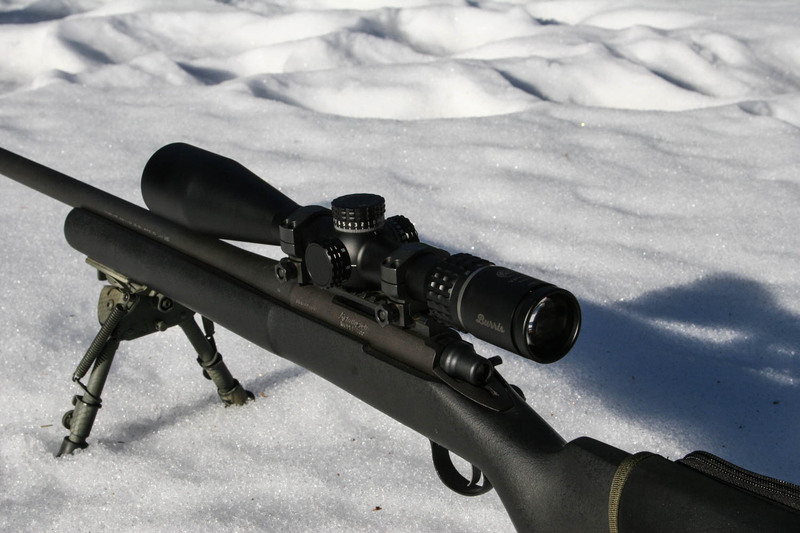 there aren’t a lot of scopes in this price range that provide the value this one does. I would argue, that a student who bought this optic over a FFP NightForce, Sig or Leupold , and spent the savings on practice ammo and range time wouldn’t be more successful than the individual that blew their wad on a top quality scope and showed up with little range time. My idea being you should have two ratings, a Sniper Central Endorsed overall rating. but also a bang for you buck rating. in my book I would give My Tall knob a 4 star rating SC style, and a 4.7 rating bang for buck. my mad knob scope I agree 100% 3 star SC rating, but Bang for buck I am at a solid 4..
thanks for the review and thanks for the amazing information on this site. Steve, Thanks for your comments and additional input and while we have not tested the tall knob version, it sounds like it may be the better option here. It sounds like it does not have the protrusion that keeps it from rotating past 1 rotation?